Recently a friend sent me his European holiday itinerary and asked if I had any travel tips or things to do at the various places he was going to visit. It looked like a fantastic trip, spanning Europe, visiting many places I have never been to, but near the end there were stops planned in Florence and Rome. We have visited Florence twice in the last few years, only for day trips and we have spent time in Rome on every holiday and know it better than most. My friend is travelling by train so will be arriving in Florence at Stazione di Santa Maria Novella. He will realise that this city was the cultural heart of the renaissance the moment he emerges from the stazione when, across the piazza, he sees Basilica di Santa Maria Novella built in 1470 and the first great basilica in Florence. We usually approach Florence from the south driving up through the Chianti region past the villages of Panzano, Greve and Impruneta to arrive in the south of city. Parking is a challenge but there has always been somewhere to leave the rental car and we inevitably end up on the banks of the River Arno with a short walk to one of four main bridges and then across to the heart of the old city. Many tourists see the statue of David standing in the Piazza della Signora outside the Palazzo Vecchio and next to the Uffizi Gallery and do not realise that it is not the original, merely a copy. The original is housed in the Galleria dell’Accademia about 10 minutes walk to the north. One of my lasting memories is of the main gallery, David standing silently at the end, and the path to him flanked by four statues partially completed and then abandoned by Michelangelo. They are known as “The Prisoners”. Prisoners because Michelangelo was said to have seen the completed statues imprisoned in the blocks of raw stone and his work was merely freeing them. That gives a unique insight into the thinking of the master artist. The Galleria is a popular place and the queues to enter can be long, but go early (it is open 8:30am to 6:20pm Tuesdays to Sundays) before the tour buses start arriving and the wait is bearable. Since we last visited, the statue has been cleaned and from what we hear some of the liberty we had has been removed. For example, we have been told that you can no longer take photos of the statue which is a great shame. The rest of the gallery is an amazing collection of sculptures and artworks and well worth an hour or two spent walking the corridors. 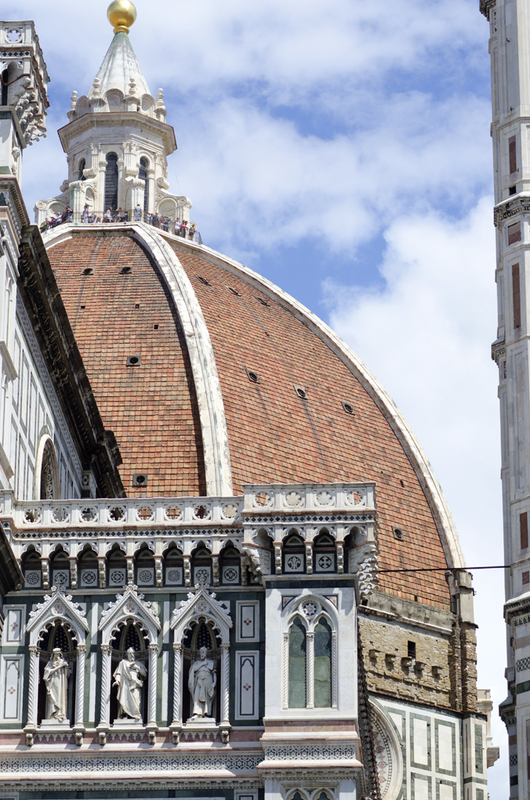 The Duomo in Florence is visible from all parts of the city. It dominates the skyline and, when you stumble upon it as are walking the narrow streets, it takes you breath away with it’s sheer size and presence. Although the Cathedral and Baptistry are definitely worth visiting, the thing I remember most was taking the opportunity of climbing to the top of the Duomo. On the way up you can see close-up the fresco on the inside of the cupola just before entering the narrowing gap that exists between the inner and outer dome to complete the climb to the top. There you are presented with a superb view of the city surrounding you and the Tuscan countryside beyond that. The climb is popular (for that read a long queue) but if you are lucky, one of those short sharp Tuscan summer showers will sweep through the city scattering the queuing crowd and the wait will be much shorter and cooler, and by the time you reach the top, the sun will have returned. There is one photograph of Florence that everyone has to take. It’s the classic shot of the city, best taken early in the morning or in the evening when the light turns orange red and the city seems to glow. 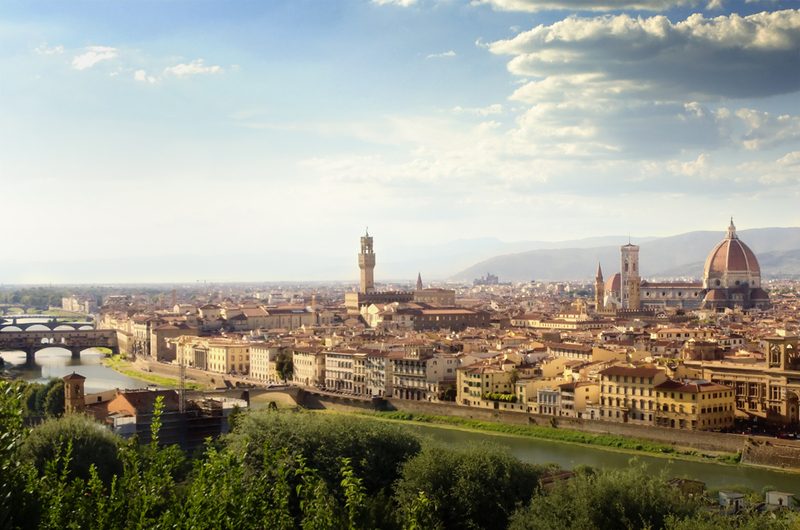 The best location is Piazzale Michelangelo where you will vie with other eager visitors for a spot to take that timeless photo as a lasting memory of Florence. 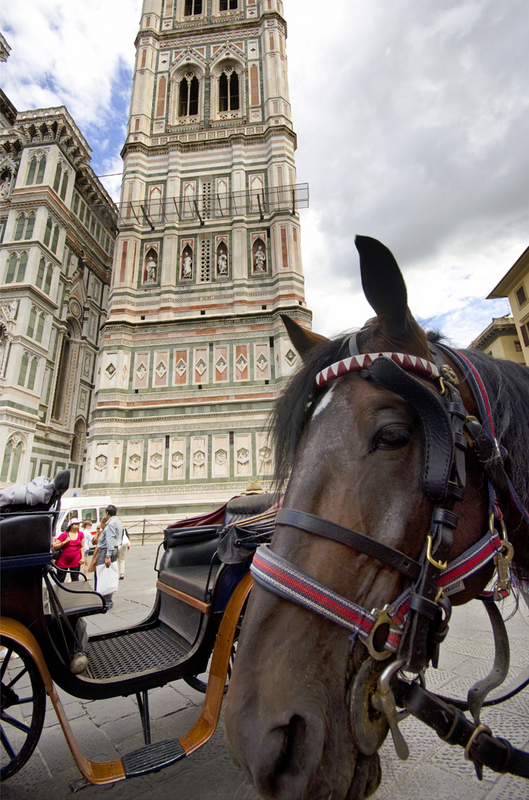 While in Florence there is always the opportunity to visit the surrounding countryside. It’s simple and cheap to rent a car for a day (don’t forget your international drivers licence) and immerse yourself in Tuscany. Head south through the Chianti countryside and visit some of the most beautiful villages in Tuscany. A forty minute drive will take you through Greve, Radda in Chianti and Castellina in Chianti all picture perfect Tuscan towns. If you venture another 20 minutes south you can visit Siena, one of my favourite Italian cities and Florence’s long term rival for control of the Tuscan region. Other things to do in Florence? I haven’t even mentioned the Ponte Vecchio and it’s gold sellers, or the Uffizi Gallery home to works by Leonardo da Vinci, Giotto, Bottecelli, Michelangelo, Raphael and Caravaggio. Even the Mercato Centrale is worth more than a passing visit. All these are within easy walking distance of each other. There is also the chance to buy some of the most expensive drinks in the world simply by frequenting one of the cafés around the Piazza della Signora. And then there is the shopping, always the shopping.